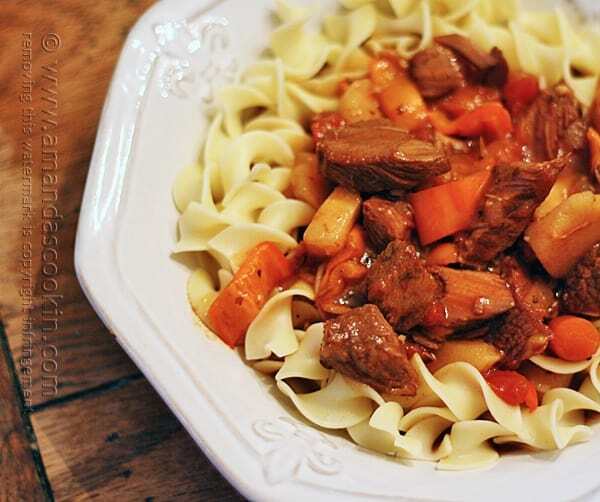 Growing up, goulash was not a meal that was served in my home. My parents are both British and goulash just wasn’t a dish they were familiar with. After I got married, I was introduced to the Americanized version of goulash that consists of ground beef, lots of green pepper and a tomato sauce which was served over macaroni noodles. It was “okay”, but really just reminded me of a bowl of pasta with chunky sauce. 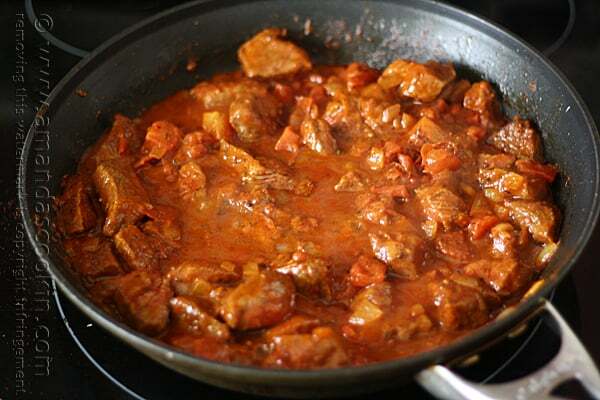 After doing a little searching, I’ve found that over the years goulash has been adapted in many forms and it’s different for everyone. 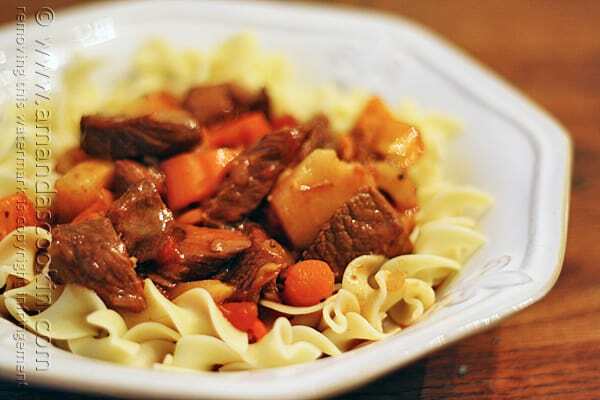 Hungarian goulash is similar to a soup or stew, depending on the thickness of your liquids, and usually contains a large amount of paprika. The thing that really caught my eye was that it was made with beef chuck roast, not ground beef. 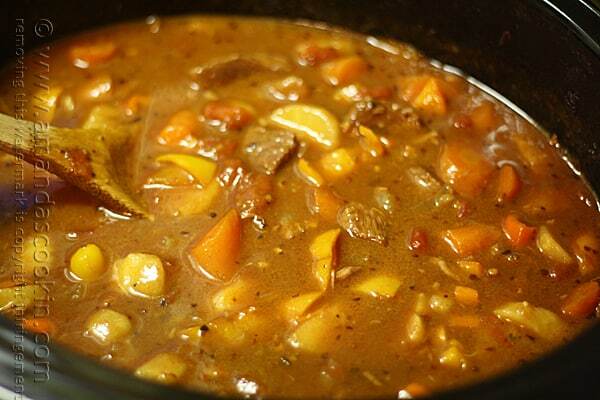 I’ve always loved a good stew and was totally ready to give this a try. I didn’t want to offend any Hungarians out there, so I did my research. 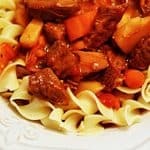 I used the basic ingredients of Hungarian Goulash and adapted it to my tastes, which is what it seems everyone does as there are so many different versions! 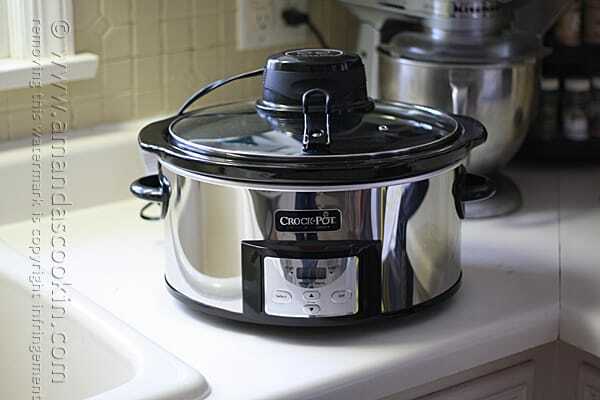 I used my new Crock-Pot® Programmable Slow Cooker with iStir™ Stirring System . I’ve always loved the convenience of the Crock-Pot®, but now it’s even better. The iStir option lets you stir your ingredients automatically (yes that means you don’t have to do it, it does it for you!) every couple of hours without ever lifting the lid. I love this new feature! It comes with two attachments. The one on the left is for thinner meals like soups, while the attachment that I used (pictured right) is for thicker meals like stews with large chunky pieces. It also has a locking lid, which I really like. It keeps all that steam inside the crock and no heat can escape. It also deters family members from lifting the lid during cooking! There’s a small amount of prep work involved before dropping everything into the slow cooker. 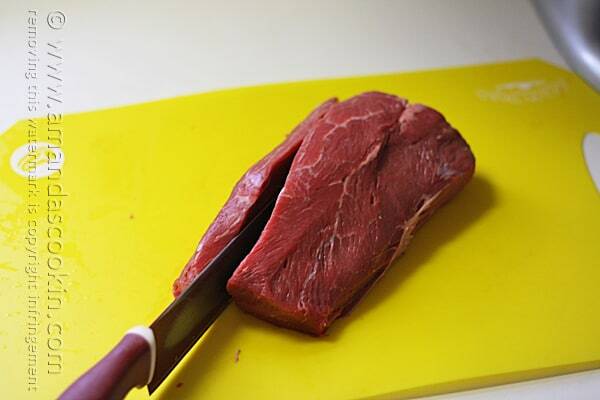 First, you’ll need to cut your chuck roast into 1-inch pieces. Next, combine herbs, spices, salt, pepper and flour in a gallon sized zipper plastic bag. 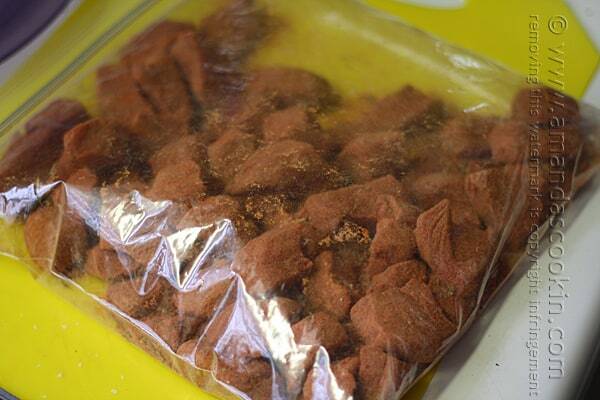 Add the cubed meat to the bag, seal and shake to coat. Meanwhile, sauté the onion and garlic in the skillet, then add entire contents of meat shaking bag to the onion mixture. 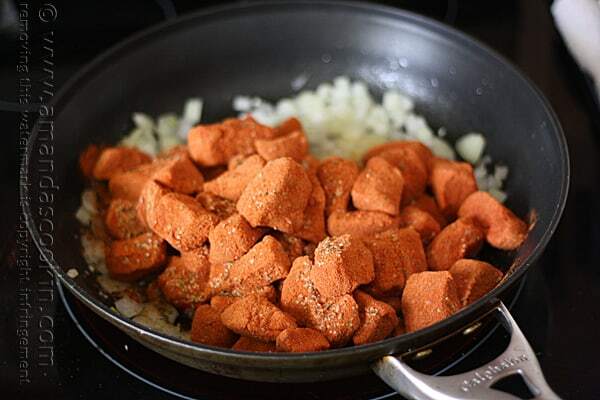 Do not discard any extra spice mixture in the bag, add it all to the skillet. Cook, turning occasionally until meat is browned well. Add canned tomatoes and its juices and stir. Turn off heat. 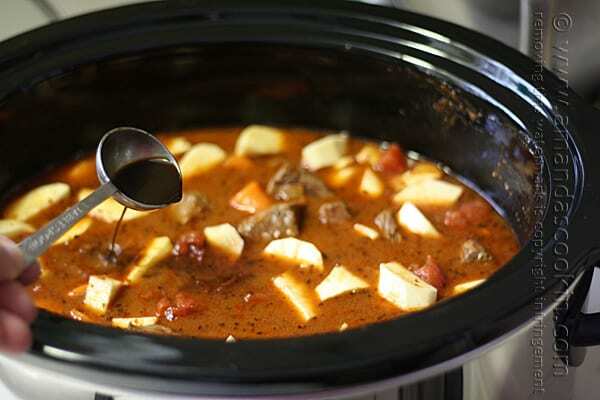 Add meat mixture to the slow cooker crock, using a rubber spatula to ensure you get all of the sauce from the skillet. Add the beef broth and the Worcestershire sauce stir gently. Add the parsnips and carrots and stir. Cover and cook on high for 4-5 hours (or low for 6-8), or until meat and vegetables are tender. Add chopped sweet peppers during the last hour of cooking. Remove lid from slow cooker and turn up to high. Put a pot of water on the stove for your egg noodles and bring to a rolling boil. Remove about 1/4 cup of liquid from the slow cooker. In a medium bowl, measure out the cornstarch. Slowly add the liquid from the slow cooker to the cornstarch, stirring as you go. Only add small amounts at a time, stir, then add more. 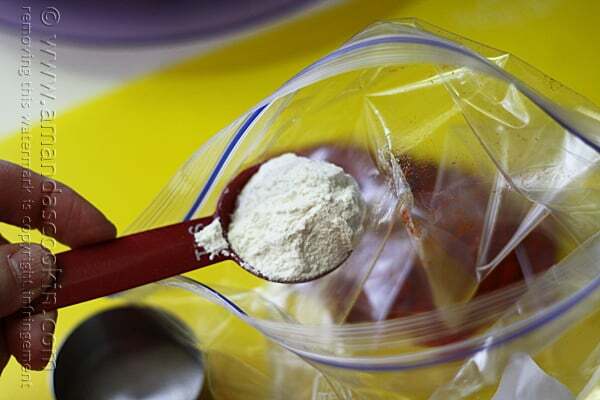 Adding the liquid all at once will cause your cornstarch to clump and it will be impossible to smooth out. Once you have added enough liquid to make the cornstarch mixture thin, add the cornstarch mixture to the slow cooker and stir. Allow the slow cooker to cook on high, uncovered, to thicken the stew while your egg noodles cook. Add your egg noodles to the boiling water and cook according to package directions. 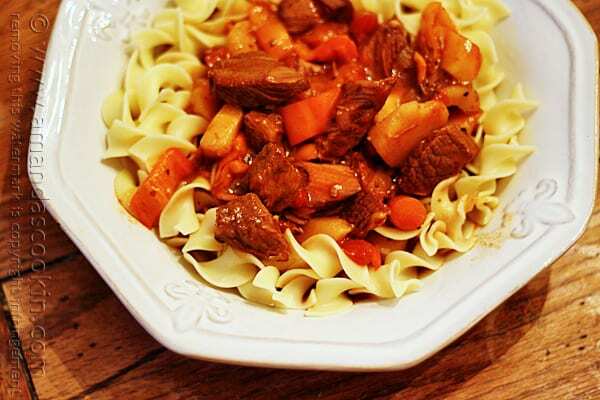 Drain and serve thickened goulash over cooked egg noodles. 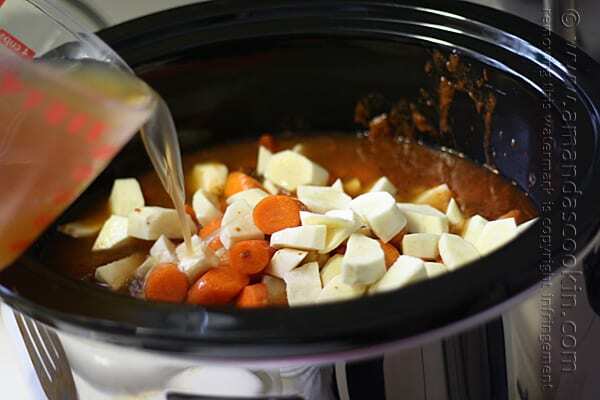 Want more recipes for your slow cooker? 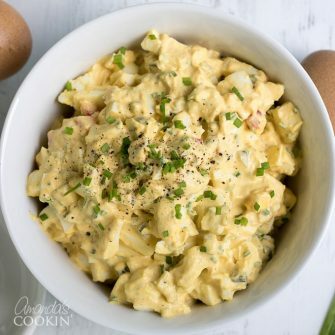 Try my crockpot mac and cheese and then head over to the official Crock-Pot® Slow Cooker website for plenty! Combine paprika, caraway seeds, marjoram, Kosher salt and black pepper in a large plastic zipper bag. Place cubed meat into the bag and close, then shake to coat. Saute chopped onion in olive oil until tender, about 3-4 minutes. Add garlic and sauté another 30 seconds. Add entire contents of meat shaking bag to the onion mixture in the skillet. Cook, turning occasionally until meat is browned well. Add canned tomatoes and its juices and stir. Turn off heat. Add meat mixture to the slow cooker crock, using a rubber spatula to ensure you get all of the sauce from the skillet. Add the beef broth and the Worcestershire sauce stir gently. Add the parsnips and carrots and stir. Cover and cook on high for 4-5 hours (or low for 6-8), or until meat and vegetables are tender. 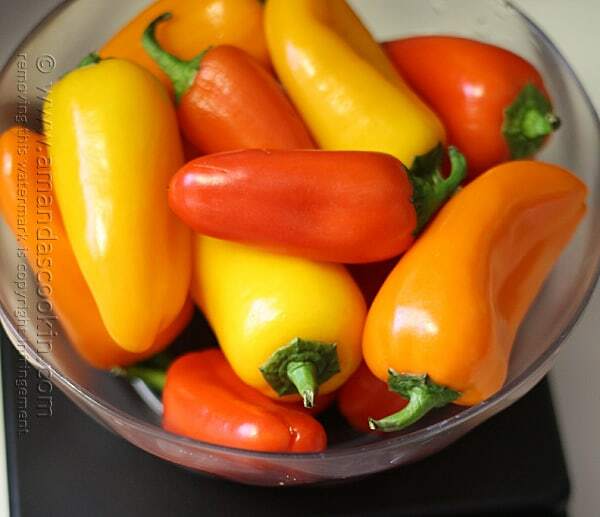 Add chopped sweet peppers during the last hour of cooking. How can I purchase a Crock Pot as shown in the Hungarian Goulaush recipe. 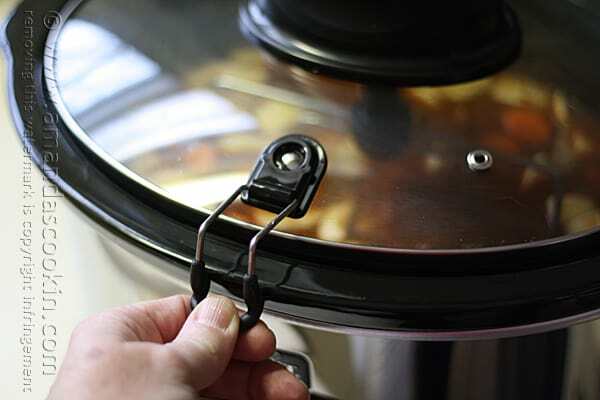 Crock Pot with snap-on lid and stirrers. Hi Thomas. There is a link to the slow cooker on Amazon right below the photo of the stirring attachments. That looks so good and I love that slow cooker! This sounds amazing! I’m going to try it this weekend! Yum! I love all your recipes and I particularly like the beef roast so I’d have to give that a go in my new Crock Pot ;) lol This recipe looks good too and I love trying new things. Do you also have a recipe for Chicken Paprikash? i will make chicken tortilla soup. I haven’t made that in a while:).